Opera and Ballet performances at Drottningholm Court Theatre. Event for the whole family in Gärdet field. The world's largest bicycle competition for women. June 6, held in the Skansen Park. End of June. (In Sweden the Midsummer celebrations are not held on Saint John's, instead the holidays are always celebrated on Friday and Saturday closest to June 24. The celebrations are held at the Skansen Park, with traditional costumes, folk music, and folk-dancing. On the many islands in the archipelago there are always a variety of events. Beginning of July. Start and finishing line at Sandhamn one of the largest yacht races in the world. Stockholm's proud white steamboat fleet on parade. Beginning of July. An international competition among world class athletics. Second Sunday in August. An outdoors performance held at the lawns at the Maritime History Museum. Mid August. A market in Vaxholm located in the northern archipelago known as the Roslagen. End of August. A ten kilometre race for women exclusively, one of the largest of its kind beginning and ending in Djurgården. Beginning of September. 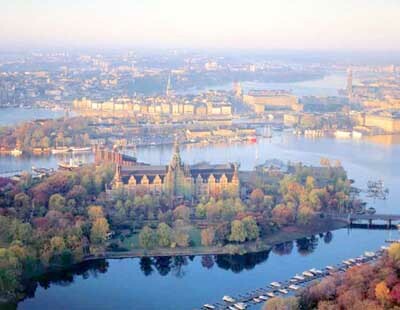 A regatta with hundreds of sailboats taking part, as well as being on display, throughout the waters of Stockholm. End of October. The famous international tennis tournament in Globen.